Here's an update of a classic summer salad. I added ripe cherry tomatoes and plenty of basil to the mix and kept the dressing more tart than sweet. I've never especially liked kidney beans, which show up in more traditional recipes, but feel free to add them. In a medium-size bowl, whisk the vinaigrette with a pinch of sugar. 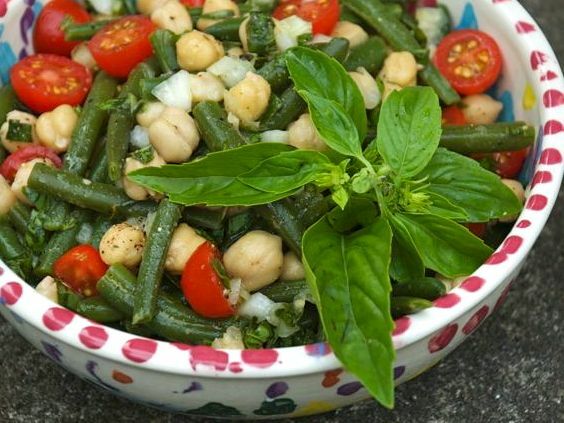 Add the onion, green beans, garbanzo beans, and chopped basil, and toss together. Season to taste with salt and freshly ground black pepper. Garnish with cherry tomatoes and serve, either at room temperature or chilled.